M21522 Evergreen Health has closed and is in receivership. We will make a complete liquidation of newly furnished medical locations. 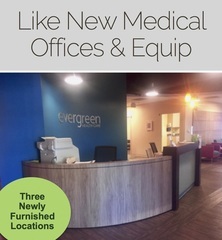 Full of hi-style furnishings, medical equipment, exam room fixtures and technology. Please see Terms for this auction for the address, Nottingham, Baltimore, & Columbia MD . AUCTION CLOSING DATE: Starts closing Monday, August 28th, 11:07 am. Bidding closes on the first item at 11:07 am, then closes at the rate discussed in these Terms and Conditions of Sale.